Creamy Lamb Korma is my favourite Indian curry recipe. Anyone who knows me knows this as I can’t seem to bring myself to order anything else off a menu. I will always try other dishes, but as much as they may be delicious it’s the creamy Lamb Korma that makes me crave Indian food. 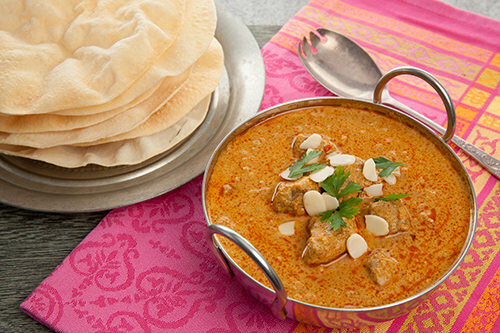 Lamb Korma is an easy recipe to make and you can cook it on the cooktop. The aroma from the spices wafting through the house really gets your hunger going. 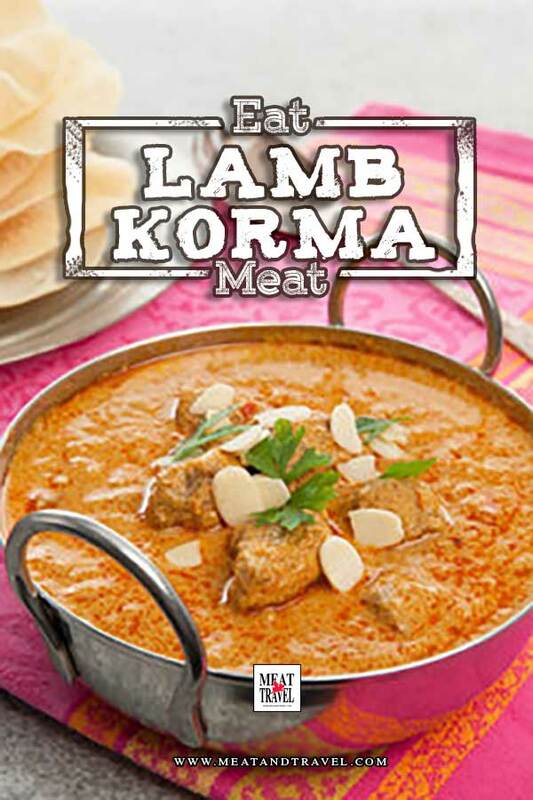 You can also make Lamb Korma in a slow cooker if you wish as the longer you cook it the more tender the meat. The following lamb korma recipe is an adaption of an old favourite handed down to me. For imperial measurements of ingredients for this Indian, Lamb Korma recipe check the recipe card below. 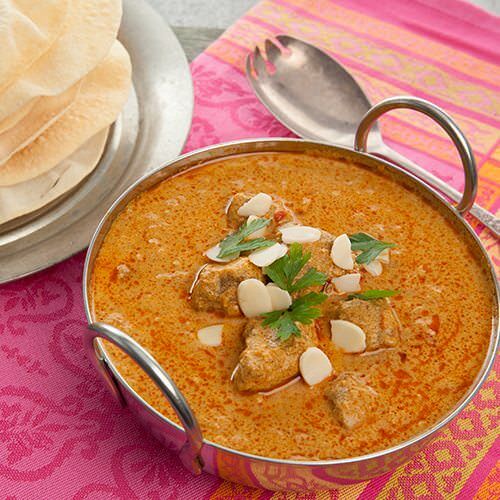 A delcious creamy indian lamb korma recipe homemade. Melt 2 tbsp ghee in a large saucepan on high. Season lamb with the spices brown in the saucepan and set aside on a plate. Chop ginger, garlic and onion in a food processor until finely chopped. Turn pan down to medium and melt the remaining ghee, add the garlic ginger and onion and masala. Stir until slightly caramelised. Turn up to high and add all of the spices (crushed cardamom, turmeric, coriander & seeds, cumin, turmeric) , stir for 5 minutes. Put the lamb back into the pan. Mix and coat lamb with the contents in the pan. add beef stock and tomato paste. add water until the mix is just covering the meat. Turn stove down to low and simmer with a lid covering the pan, stirring every 15 mins until lamb is very tender and sauce covers the meat. Add water if needed to cover during cooking. Serve in bowls, add a dash of yoghurt and garnish with cashew and coriander. A Delicious & EASY to Make Creamy Indian Lamb Korma Curry. Made from a simple & "authentic" home recipe. Very easy to cook on the stove top. The Spicy Aroma will have them lining up at the door, it's always a HUGE hit! Chop ginger garlic and onion in a food processor until finely chopped. Turn pan down to medium and melt the remaining ghee, add the garlic ginger and onion and masala. Stir until slightly caramelised. Turn up to high and add all of the spices (crushed cardamon, chilli, coriander & seeds, cumin, tumeric) , stir for 5 minutes. Put the lamb back into the pan. Mix and coat lamb with the contents in pan. add beef stock and tomato paste. add water until mix is just covering the meat. Turn stove down to low and simmer with a lid covering the pan, stirring every 15 mins until lamb is very tender and sauce covers the meat.Add water if needed to cover during cooking. If you’re looking for a healthier nut free version try this Low Carb Nut Free Lamb Korma from My Keto Kitchen. To make this Lamb Korma recipe in a larger batch adjust the servings in the card above.